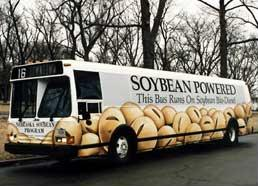 Biodiesel is a clean burning alternative fuel, produced from domestic, renewable resources. Biodiesel contains no petroleum, but it can be blended at any level with petroleum diesel to create a biodiesel blend. It can be used in compression-ignition (diesel) engines with little or no modifications. Unblended biodiesel is simple to use, biodegradable, nontoxic, and essentially free of sulfur and aromatics. Biodiesel is made through a chemical process called transesterification in which glycerin is separated from fat or vegetable oil. The process leaves behind two products — methyl esters (the chemical name for biodiesel) and glycerin (a valuable byproduct usually sold to be used in soaps and other products). Biodiesel is not the same thing as raw vegetable oil. Raw vegetable oil cannot meet biodiesel fuel specifications, it is not registered with the EPA, and it is not a legal motor fuel. Fuel-grade biodiesel must be produced to strict industry specifications (ASTM D6751) in order to insure proper performance. Biodiesel that meets ASTM D6751 and is legally registered with the Environmental Protection Agency is a legal motor fuel for sale and distribution. Interest levels in biodiesel vary across the Nation and seem highest in the states producing the feedstocks and refining the fuel. PHMSA will expand its focus on biodiesel as the nation and individual states increase annual production levels. PHMSA will address infrastructure challenges and remove identified barriers to the safe transportation of biodiesel through pipelines in the coming years. For information on PHMSA R&D related to biodiesel, please visit https://primis.phmsa.dot.gov/matrix/prjQuery.rdm. Unselect all filters; then, select the filter for “Subjects/Threats” and using the drop down box, select “Biodiesel” from the list. This will itemize all related projects.